Immediately after LA, even before i had time to drop my bags at home, we headed straight for Beef Ball noodles! So here we are…. at my favourite beef ball noodle stall in Tengkat Tong Shin. I remember someone once told me that they preferred Soong Kee Beef Ball coffee shop down by Jln HS Lee… Ya, well, we find that whilst the soup is sweet, it lacks that thick beef stock aroma. 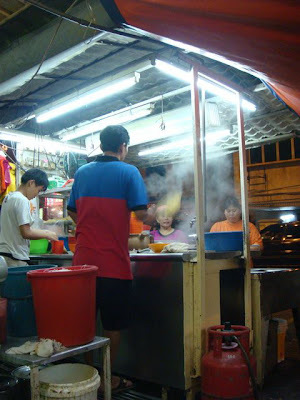 No doubt not as clean as Soong Kee, but if your stomach is strong, and you have poor night vision (hahaha), then this place is by far , the better of the two.. The noodle is cooked .. needless to say, al dente… chewy chewy baby…. Double, double toil and trouble;Fire burn, and cauldron bubble !! !